Accountemps is the world’s first and largest specialized staffing service for temporary accounting, finance and bookkeeping professionals. Visit the company’s Small Business Center at ww.roberthalf.us/smallbusinesstools for workplace research and resources, and gain insights into the latest accounting and finance hiring and salary trends at www.accountemps.com/salarycenter. This is good news for employers who foster supportive cultures. Organizations that build an environment where people are proud to work, are able to partner with and learn from colleagues they respect, and see their contributions are valued can experience greater productivity and innovation. Conversely, businesses that fail to establish such a culture can hamper morale, negatively impacting the performance of their teams and company. 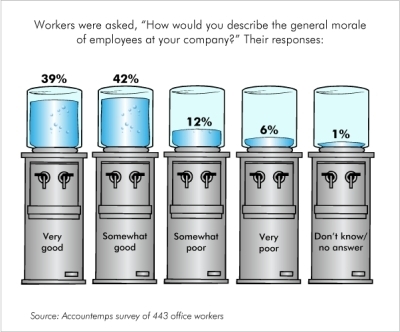 The challenging part for employers is that while building up and maintaining morale requires diligence and focus, it can take just one slip – failing to acknowledging the efforts of your team during a critical stretch or not communicating about an upcoming business change, for example – for the mood in the office to sour dramatically. 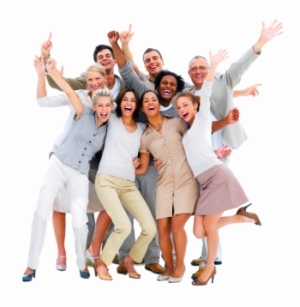 Small business owners and managers have a great opportunity to positively influence morale. Void of potentially cumbersome bureaucratic and personnel layers, they are often better able to interact with their teams and discuss what is working or not and forces affecting the organization. Simply talking to employees about the business and challenges they face in their roles can help you boost your firm’s morale and productivity. 1. Assuming employees are lucky to have a job:No matter the economic environment, top performers always have options and may look for other opportunities if they don’t feel appreciated. Thank staff for jobs well done, and make sure they have the resources they need to be successful and advance with your company. 2. Failing to promptly answer emails and voicemails:Few things show a lack of care as much as not responding to people in a timely fashion. People will understand if you’re busy, but acknowledge the communication and set expectations about when you can respond. 3. Ignoring rumors about the business:Keep staff apprised of news about the company’s performance, even if it’s not positive, and make yourself available to answer questions employees may have. If you keep quiet while the rumor mill churns, worker frustration and concerns can grow, and morale-busting uncertainty and resentment can quickly spread throughout the organization. 4. Creating a “no” zone:Avoid fostering an environment where people see their ideas languish because they lack support. Encourage your team to be creative. Though you may not be able to immediately implement a proposed initiative, explain why and let staff know you value their input. If a suggestion needs refinement, work with the person to hone the pitch. 5. Failing to recognize staff accomplishments:Acknowledge employees for their contributions to your organization’s success. Bonuses and financial rewards are valued, but your efforts don’t need to be costly – or cost anything at all. Oftentimes, a pat on the back and sincere thanks are what employees need to know. If you are able to offer more formal rewards, make sure they’re meaningful for the individuals on your team.